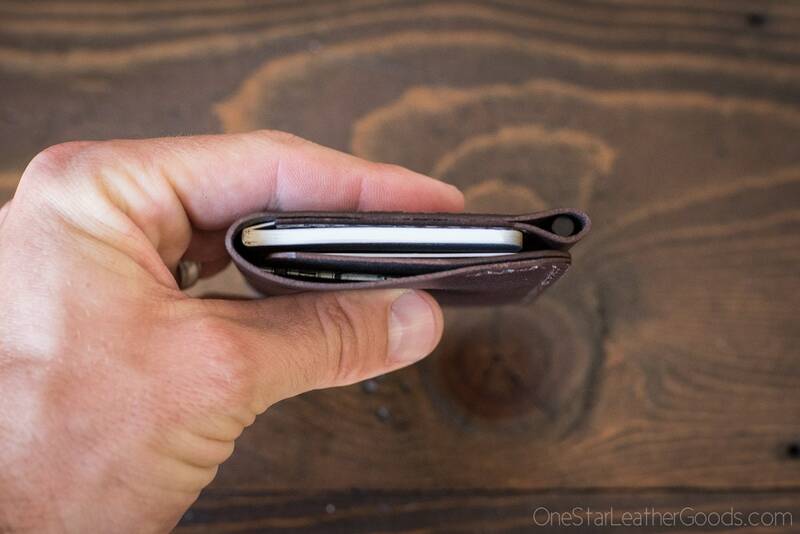 A tiny notebook wallet for cards and cash that comes with a 2.5"x4" notebook and Fisher Space Pen. Handmade and saddle stitched. Great for front or back pocket carry. 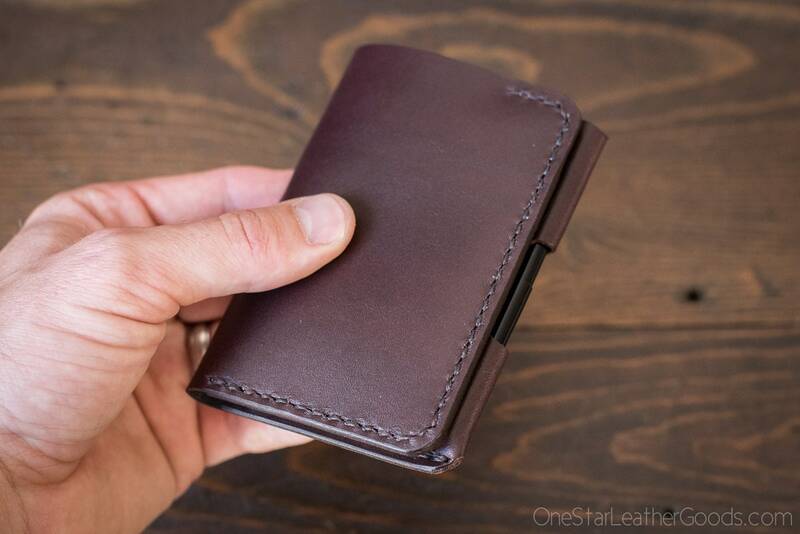 People who appreciate good old paper and pen will love the functionality and pocketability of this small wallet. I had been wanting to combine a small wallet with a tiny notebook for some time, so when my cousin called me in 2012 and requested exactly that, I immediately got to work. My cousin is a singer/songwriter living in Brooklyn, NYC (www.johndelore.com). He gave the product its name as he figured it would be a hit in his neighborhood. 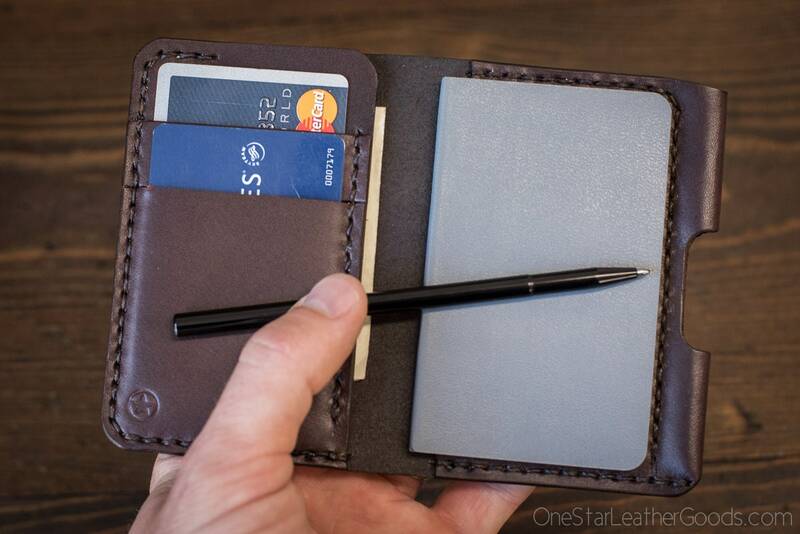 Here is the result: a compact simple wallet, tiny notepad and pen. A lot of time and effort has lead me to this design, and I stand by its quality and utility. 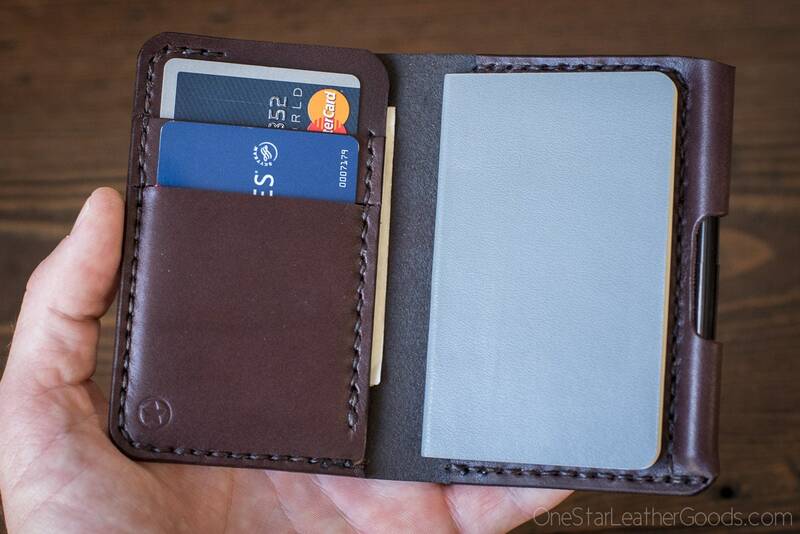 Two card slots on the left fit 2 cards each (more when broken in), behind those is another pocket with a partially open top to facilitate access to your once-folded bills, business cards or whathaveyous. You can also tuck cards or that special someone's phone number behind the notebook. I keep stitching off the spine where it receives the most wear and I've sized the dimensions exactly so your folded bills won't be crushed when the wallet is closed. Includes a Fisher Space Pen Stowaway. While it is the smallest Space Pen, when posted it is near full size and comfortable in the hand. Space Pens use pressurized ink cartridges that can withstand extreme temperatures and will write upside down, in zero gravity and underwater. Perfect for every day carry. The hole in the pen sleeve is to facilitate removing the pen. The pen sleeve will start out tight on the pen but will break in to a perfect fit. I also make this wallet with a slightly larger pen sleeve that will work with the Fisher Space Pen BULLET and the Kaweco Liliput fountain and ballpoint pens. 11.5cm x 8.5 cm closed, 16.5cm x 11.5 cm open. Top quality bridle leather from the Wickett & Craig tannery. 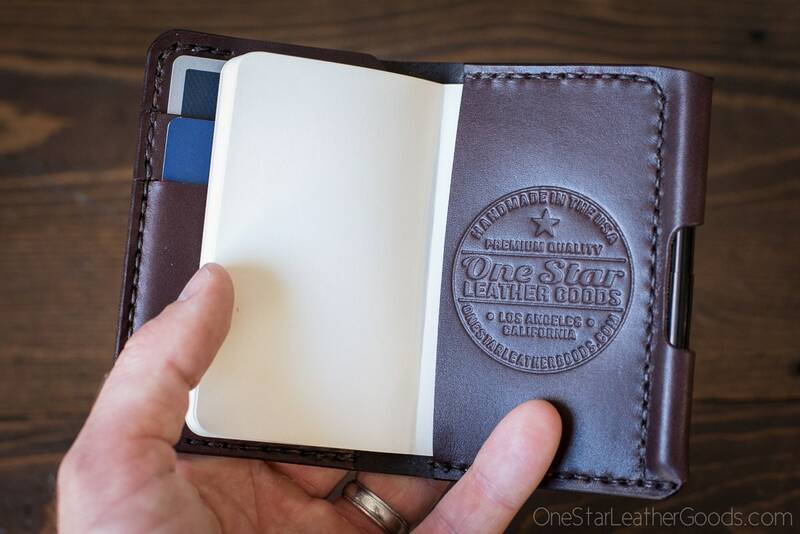 This leather is thin, durable and will age wonderfully. Holy cow!! Literally.. 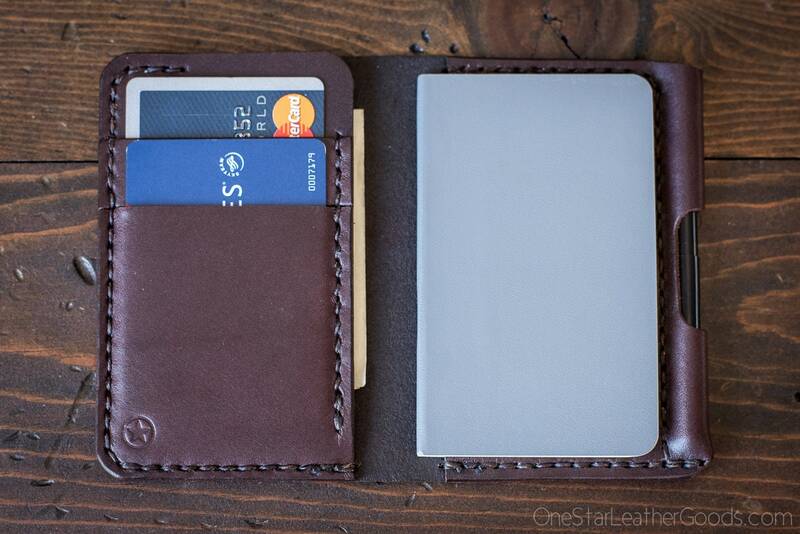 This is the upmost highest quality wallet I've ever seen. I don't leave reviews but this listing deserves one. If you're on the fence about this wallet don't be. Just get it you won't be disappointed and it arrived quickly. Keep up the good work guys! 2 thumbs up.